FAQ's - Click Question to See Answer! This is always our #1 question! The very short answer is YES! The longer answer is YES, IT REALLY DOES WORK! But it is not magic, it’s science. Fish are naturally curious and hungry. They sense the sounds and vibrations it produces and think it’s feeding activity then move towards it, in search of their next meal. Click Here to read more about the science behind it! All orders are now handled by our partner Clever Training. Please Click Here to place your order through their website! Can I Buy It on Amazon? Sellers on Amazon are unauthorized and we cannot verify that the product is authentic. We don't warranty product purchased on Amazon and can't uphold the 6 Month Money Back Guarantee. We recommend that you purchase our product from our site, or one of our authorized retailers that you can find here. When Will Mine Come In? Most orders ship out the next business day! For domestic orders (USA), you can choose between Fedex Smartpost (4-7 day transit time), USPS Priority Mail (1-3 days transit time), and USPS Express (1-2 days transit time). International customers, please see the estimated transit time on the shipping method you select. Does it work in Fresh Water? Yes! Our customers are having excellent results with Bass, Catfish, Crappie, Bluegill, Salmon, Pike, Striper, Hybrid Bass, Yellowtail, and many other Freshwater species. Click here to read more. Absolutely! Our customers are having fantastic results with Speckled Trout, Redfish, Black Drum, Yellowtail, Flounder, SheepsHead, Black Tip Shark, Blue Fish, Channel Mullet and many other Saltwater species. Click here to read more. We don't think so! It's just a new, fun way to help increase your chances of catching more fish! If you think about it, unless you're an eagle, bear, or are into noodling, everything that you use for fishing can be considered cheating! ALL fishing gear is designed to give you an advantage, and ours is just the latest high-tech gadget designed to help you catch more. We ask that all of our customers respect and abide by the legal size and creel limits set forth by their local fisheries agency, and practice catch and release wherever possible. It’s not magic - it’s science! It produces sounds and vibrations. Fish are naturally curious (and always hungry!) and head towards these sounds and vibrations in search of their next meal! Click here to read our page about how it works. If you fish for game fish, we believe that it will work for you. We have a 6-Month money-back guarantee. Read the full guarantee here. The short story is that always knew that fish were attracted to sound. We also love tinkering with things and building new gadgets. We figured we could use the latest technology to build a device that would help us catch more. Jack was 15 at the time and home-schooled. Since then, we have worked nearly day and night to build prototypes, obtain patents, do market research (fishing), etc. Jack, now 17 has done the engineering, prototype production, 3D computer modeling, 3D printing, web development, video editing, manufacturing research, etc. to get the product to where it is today. Yes. The TactiBite Fish Call currently has multiple granted and pending patents. We use state-of-the-art hydrophone and computer technology to record and simulate the sounds and vibrations of feeding fish! The TactiBite Fish Call itself weighs under a pound, and the included anchor adds on another 9 ounces. Total Weight: 1.6 lbs. Diameter: 3.5". Height: 8". Unlike other devices that many consider to be gimmicks, we certainly can’t guarantee that you will catch fish while using it. It’s not magic and the catching part is still up to you. It will attract nearby fish to the area where it’s floating and increase your chances. What we can guarantee is that you’ll be satisfied with our product, or we’ll gladly refund your money in accordance with our published refund policy. We can also guarantee that you’ll have fun with it! Yes, it uses (3) regular AAA batteries (not included). It will run for 20+ hours on fresh AAA batteries, plenty enough for several days of fishing. We recommend removing the batteries when not in use to prevent corrosion. How many should I fish with? At least one, but more is better! We always fish with at least 2 of them and up to 4 depending on where we are fishing and how many people we have. What volume level should I start with? We recommend starting with a low volume setting unless it’s extremely rough or lots of boat traffic. It is very loud under water and there is a risk that if it’s too loud, it could actually scare the fish away. What sound should I use?  Our Scared Shrimp™ sound is our “go-to” sound for salt water and our Rattle Battle™ is our go-to sound for fresh water, but we have had success with all 3 sounds in both fresh and salt water. It is fishing, and just like different lures work better on different days, the TactiBite Fish Call is no different. We get asked this a lot! Yes, it is, just make sure you don’t keep more than your limit! What keeps it from floating away? We have invented a custom anchoring system. You just un-spool the attached line and toss the TactiBite Fish Call and the attached anchor in. The anchor holds it in place. When done, the anchor line wraps up around the anchor and snaps into the TactiBite Fish Call for easy storage. If fishing from a boat, either cast next to it or snag the anchor line, or just motor or troll to it and pick it up. If fishing from a dock or shore, either cast to it and snag the anchor line, or just tie a string to it when you throw it out. Can I troll with it? Yes! Just remove the anchor and tie the TactiBite Fish Call to one of your rods. We troll it back the same distance as our lures are behind the boat. We recommend increasing the volume when trolling with it. When Does Your Shark Tank Episode Air? Our episode aired on September 30th, 2016 at 8pm Central time. It's season 8, episode 2! Were you nervous when you pitched on Shark Tank? We weren't nervous when we finally got to pitch. We basically took our nervous energy and turned it into excitement. We were so hyped up for the pitch that we felt invincible. We knew our numbers and of course have great enthusiasm for the product. We also knew that it was our one shot, so we just went for it and left it all out there. We applied for the show and went through a very long selection process. We knew our product attracted fish. We had no idea that it would work so well on sharks! We were one of only a few companies selected out of close to 50,000 applicants! What has Shark Tank done for your sales? It gave us worldwide exposure and credibility and is having huge impacts on our sales! Do you give other businesses advice?